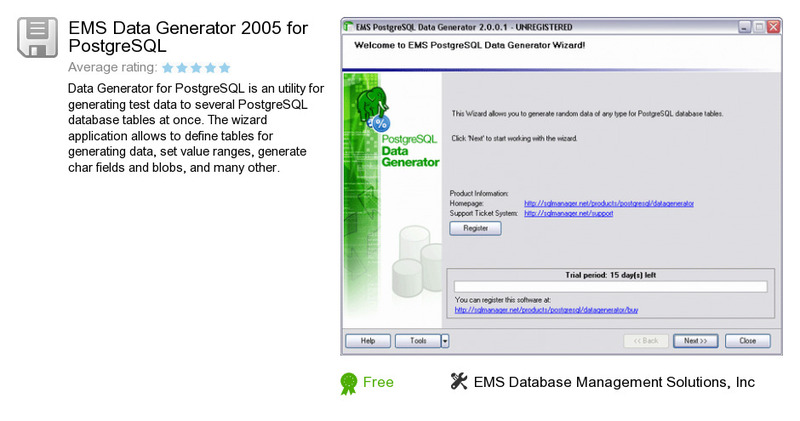 EMS Data Generator 2005 for PostgreSQL is a software program developed by EMS Database Management Solutions, Inc. We know of version 2.3. Version 2.3 is available for download at our site. EMS Data Generator 2005 for PostgreSQL installation package has a size of 10,249,594 bytes. EMS Database Management Solutions, Inc also publishes EMS Data Generator 2005 for SQL Server and EMS SQL Manager 2008 Lite for InterBase/Firebird.